Buy Cheap Umarex 2291023 Ram Combat .43 Cal. Brown Paintball Gun|ReplicaAirguns.ca | Easter Weekend Sale! The RAM Combat milsim training pistol is made in the likeness of one of the most carried sidearms. This Real Action Marker is authentic in weight, feel, and action, right down to the realistic kick of its blowback slide. This RAM marker can effectively fire .43 caliber paintballs or rubberballs at a range of 50-70 ft. 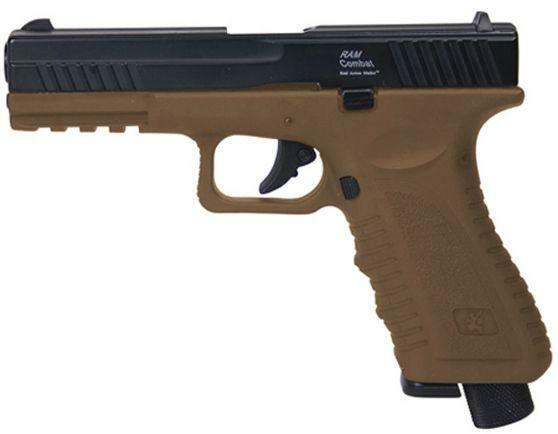 The Combat training pistol can also be used as a paintball gaming pistol for close-range combat and features an integrated accessory rail and a drop-out 8-shot magazine. The RAM Combat pistol fits duty and tactical holsters and is powered by a single 12 gram CO2 cylinder located in the grip of the airgun. Includes one magazine and plastic case. CO2 and ammo not included. RAM markers are used extensively in mil-sim (military simulation) games.